This is a really pretty gift package for giving small items. 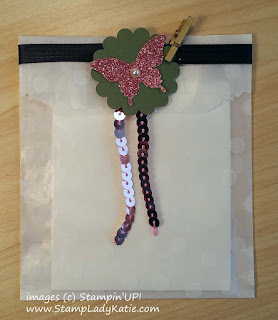 These are Stampin'UP! 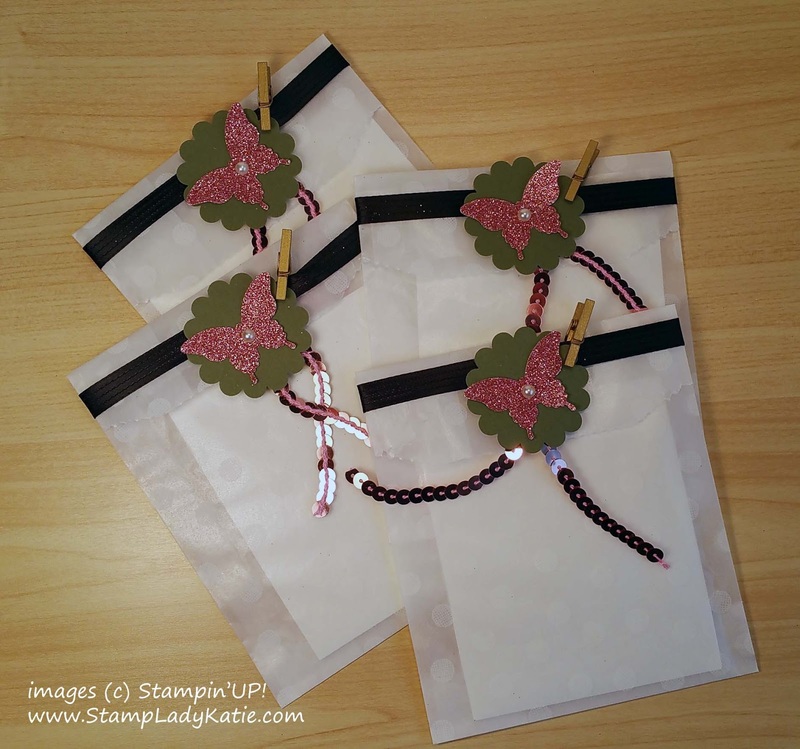 's Sketched Dots Tag a Bag Gift Bags. The bags are a translucent "glassine" material with a very subtle and pretty white sketched dot pattern. 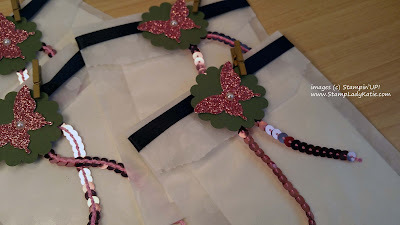 Its very classy looking, especially with the sparkly glimmer paper butterfly and the shiny sequin trim. And SO SIMPLE to put together. wrapped black satin ribbon around the top and secured it with a glue dot. Voila! Click HERE to watch a 5 minute VIDEO showing how I put them together. All product used is shown in the chart at the end of the post. The Tag a Bag Gift Bags fit a variety of small items. Use them for gifts or favors for a shower. What small items can you think of to fit in these bags? Spring isn't far off and a seed packet is always a nice gift. Cookies? A recipe card and spice pack? Small health and beauty items? Baby Booties? Jewelry? How would you use them? 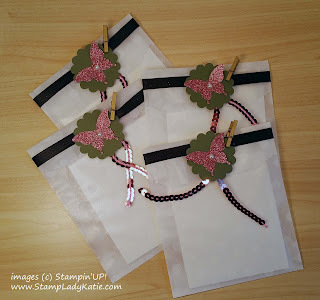 Leave a comment with what you'd put in these cute bags. These particular bags are gifts for new members of the INKcredible Crafty Crew. I filled mine with a sheet of Dimensionals to use as welcome gifts for the people who join our craft group during the months of February and March. 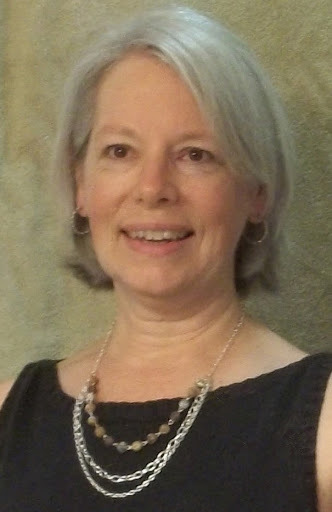 Joining is simple, anyone who buys the Starter Kit is automatically a member. Bonus: The Starter Kit is on sale through the end of March! What is the Starter Kit? Anything you want - whats on your wish list? Pick out up to $155 of product and pay only $99 + tax. Plus shipping is free with this sale purchase. Got a few big ticket items you've been saving up for? Now's the time folks. You'll be getting a 30% discount over retail with this purchase. This is the same kit you'd buy if you wanted to be a demonstrator, but you can also buy it just because its a smart purchase. Also, for the next 3 months you'll have a 20% discount if you choose to buy anything else . . . and you can renew that discount option if you want, its your decision. This is a total win-win choice here. Once again, this is the same purchase as the demonstrator Starter Kit, BUT you are not obligated to sell anything. Email me if you have any questions, or you can Buy the Kit HERE.